At the Center for Free-Electron Laser Science in Hamburg, an international focal point has been established for basic research on and with free-electron lasers. 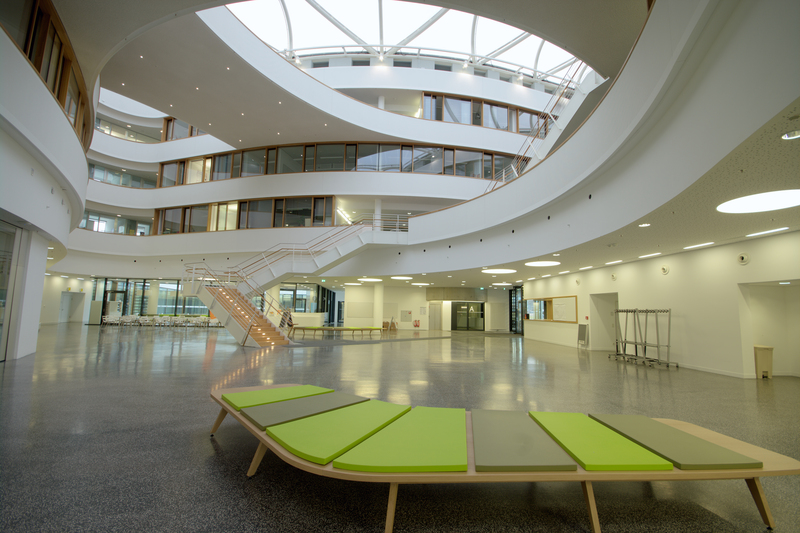 The center represents the first cooperative endeavor between the University of Hamburg, the Max Planck Society and the Deutsches Elektronen-Synchrotron (DESY) for the purpose of intesive cooperation in a shared building. One of our first concerns when launching the project was to find out in conversations with the directors in charge at the three independent research institutions how the scientists in the various groups intended to collaborate, what kind of “spirit” the building should manifest, and which architectural environment might best support the diverse work processes. Both elevated laboratories and vibration-isolated physical measuring rooms were called for, as well as offices and conference rooms. The demands placed on the structural dynamics of rooms for working with high end lasers are extremely high, which made it expedient for several reasons to arrange these rooms together on the ground floor. The experiments furthermore require shielded working conditions, which made it very important to put the scientists in close proximity to the areas for joint utilization, thus conjoining theoretical and experimental activities. In order to generate a high level of synergies between the various research groups, areas between the rooms have been opened up to promote communication. Above a one-story structure set aside for experimental work rise three office floors in the form of a rotunda containing rooms offering a variety of different layouts. Along with cubicle offices, there are also combi-zones, tea kitchens and conference rooms spread throughout the atrium spaces. The central atrium serves the purposes of communication and knowledge transfer, connecting the various functional areas over four floors. The ground floor contains all experiment areas, the seminar rooms and a cafeteria, arranged around the light-filled entrance hall and two central garden courts. The ground floor with its laboratories and the office floors located above are distinguished both formally and thematically. Their design and outward appearance convey the contrast between the laboratory versus the office function. In thematic terms, the ground-floor level forms a solid and closed base for the rotunda element. The self-contained solidity of the base is underlined by its almost complete lack of windows and an exterior cladding of narrow bricks. Diametrically opposed to this handling, the three office floors have been given a light and transparent facade with linear bands of windows, which emphasizes the roundness of the structure. The character of the atrium is shaped mainly by the free-form skylight above. This consists of a filigree steel grid supporting multi-layered cushions of translucent ETFE (ethylene tetrafluoroethylene), supplying the building with a bright and lightweight crowning element.